In the latest release of silver for sale in the Amy Brown Collection, the Anonymous Mint captures another design from the portfolio of Brown’s watercolor fairy works. This fourth design features the image of Discovery, another of Brown’s very delicate and inspiring fairy designs. 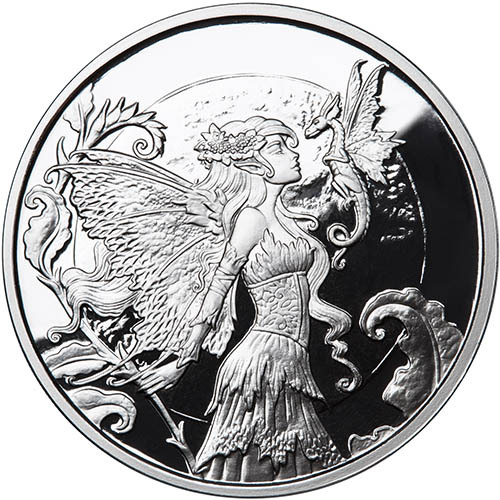 The 1 oz Proof Silver Amy Brown Collection Discovery Fairy Round is now available to you for purchase online at Sivler.com. Ships to you housed within protective plastic capsules with individually numbered Certificate of Authenticity! Fourth issue of a fairy design in the Amy Brown Collection! Obverse captures the image of the fairy Discovery. Reverse bears the image of the fairy known as Dusk. Individual serial number on the rim engraving. Based upon the work of Amy Brown. The Amy Brown Collection from the Anonymous Mint features a total of six designs. With each of the available design releases, you’ll find six silver rounds to choose from when buying. The rounds are available in 1 oz and 5 oz weights, with each weight featuring a proof, antique, and colorized proof option. Lead coin creator Julie Lindquist of the Anonymous Mint hand-selected the six designs featured in this collection from a portfolio of works by Brown that includes 2,000 options in total. The proof rounds in the collection have standard proof touches which include frosted, matte elements to the design and a background field that is clear and deeply-mirrored. 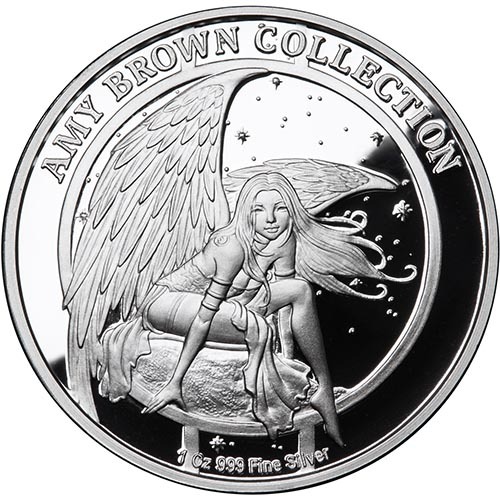 On the obverse of each 1 oz Proof Silver Amy Brown Collection Discovery Fairy Round you’ll notice the image of Discovery. She is depicted here in right-profile relief with a small dragon in front of her and fern leaves that envelope her figure to frame the fairy. The reverse of the Proof Silver Amy Brown Collection Discovery Fairy Rounds bears the image of Dusk. This fairy was created in 2003 by Brown and features bird-like wings with long, flowing silver hair. She is set on a high perch where she watches over the fairy realm as day transitions to night. Twinkling stars are in the sky above as the twilight hours of dusk arrive, and Dusk is on guard. Your purchase of a 1 oz Proof Silver Amy Brown Collection Discovery Fairy Round comes with a protective plastic capsules to ensure the quality of your round. Each one comes with a numbered Certificate of Authenticity which matches the individual serial number engraved with edge lettering on the round’s rim. We encourage our Silver.com customers to call us with questions at 888-989-7223. You can chat with us live online or simply send us an email with your questions.